Iker Sedeno is a Master's student in Spanish and a Graduate Teaching Assistant. He holds a Bachelor's degree in Spanish, with a minor in Teaching English as Second Language, from the University of Arkansas Fort Smith (UAFS). His academic interests include the bilingual (Nahuatl-Spanish) poetry of indigenous groups in Mexico. 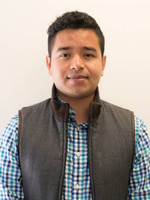 At UAFS's 10th Annual Student Research Symposium he presented his work, “The Embodiment of Nahuatl Ideology in the Poetry of Natalio Hernandez,” for which he won an award. Also, he believes that traveling the world provides multiple benefits to students, that's why he spent summer 2017 traveling through six countries, including: Japan, Taiwan, Thailand, Germany, Spain, and Scotland.